When the Kellis-Amberlee virus sweeps across the world, infecting everyone and causing the deceased to rise from the dead, it was social media-not corporate news-that carried the story and gave the survivors a fighting chance. When sibling bloggers Georgia and Shaun Mason are chosen to cover a historic presidential campaign, they know they will have to ask the tough questions while delivering crowd-catching content, but they have no idea they will also be embarking on a dangerous investigation of the virus that has shaped their world (and their occupation) for the last twenty years. Of the wide array of zombie fiction released in the last five years, Mira Grant’s Newsflesh trilogy (of which Feed is the first installment) is exceptional. Grant paints a rich, detailed landscape of life after the end of death and more importantly, moves past tales of survival to explore the evolution of human technology, culture, and communication in a post-Outbreak world. A must read for fans of zombie fiction. What does it take to be truly healthy? There is so much differing (and often conflicting) advice on the topic that A.J. Jacobs spent two years researching, examining, and experimenting with different methods for improving his mind and body, including protecting his ears with noise-cancelling headphones, running (literally) to all of his errands, and working on a treadmill desk. As with every A. J. Jacobs experiment, the journey is as important as the destination and readers will be treated to the usual bits of wit, perspective, and heart. By the end, he had lost almost 20 lbs of jiggle, gained a brand new body shape, increased his energy levels, and even had an abnormal mole removed by a dermatologist. The result? A happier, healthier A. J. As for the keys to his success, you’ll have to read to find out! Changes in India's economy are happening at such rapid speed, it seems like the country is heading in a positive direction with opportunity and wealth available to all. While the middle and upper classes are gaining, India still holds 1/3 of the planet's poor who are not experiencing the same advancements. 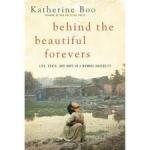 Katherine Boo spent several years chronicling the lives of the people living in Annawadi, a Mumbai slum located near the international airport. Behind the Beautiful Forevers is narrative nonfiction at its best. Dramatic, fast-paced and reads like a piece of contemporary fiction. There’s man fiction and there’s older man fiction. Jim Harrison’s (MSU grad) “The English Major” falls into another category altogether (which tends to blend the three) older man literary fiction. Cliff’s wife of nearly 40 years has just divorced him to reconnect with a flash from the past. Cliff, previously an English teacher and then a farmer in northern Michigan, must leave his farm and decides to take a road trip west. Here he hooks up with a former student, visits his Hollywood producer son, and goes on many hair-brained adventures he learns his body can no longer handle. But more than what happens in the story is the assured, humorous voice of Cliff finding his way through. Harrison touches on many of his loves in life including cooking, the natural world, and poetry throughout, never dwelling on one for too long, because like Cliff’s journey the inner narrative is too interesting to stick to one narrative. For those who like to go along for the ride with a great character and learn a bit about themselves in the process. The third book in the Inspector Vaara series, Helsinki White is a much darker and cynical look at Finnish life. Kari Vaara is now the head of a special crime unit that borders on the criminal side. Racial hate crimes are becoming more common. A mysterious former French Legionnaire has also taken an interest in Vaara's work, especially an unsolved kidnapping/murder and a more recent murder of an extreme-view politician. The world discovers that there is a giant cylinder hurtling through space on the edge of our solar system and headed to our sun. It’s shape alone indicates that it must be produced by an alien intelligent life and an expedition is sent out to investigate. The astronauts discover that this mysterious object they have dubbed Rama is hollow and find a way to enter and explore. Inside they find what appears to be some type of abandoned habitat that is millions of years old but slowly waking up to their presence. This collection of poems by Chicago native and artistic director of the Chicago Youth Poetry Festival Kevin Coval is an imagining of how a new Elvis would come up, act, and be accepted in the world’s most popular musical art-form, rap. Coval certainly pulls from his own life as a hip-hop and rap artist (he's a four-time HBO Def Poet) but combines it with “other whiteboys who consider themselves down,” such as “Elvis Presley, Vanilla Ice, Eminem, …, the Beastie Boys …” to make a character, L-Vis, who struggles with his whiteness in a mostly black music and language. Coval takes us through the first mix tape, the high school rap that changed it all, getting signed and frustrated in the music business, and the subsequent bottoming out and return home. He ends the book with a suite of poems for John Walker Lindh, the American who joined the Taliban, titled “White boy I could’ve been” which takes a compassionate look into this young man’s thinking. A great book for anyone who likes/loves hip-hop. This book (I listened to the CD recording) covers a whole cast of characters whose lives are made and lost on a claims horse-racing track in Wheeling, West Virginia. There's Medicine Ed, a horse trainer and track lifer, just looking for a home. There's another lifer, Deucy, a self-professed old lady "gyp," who offers lots of off-beat color. There's handsome newbie and upstart, Tommy Hansel, who receives his support in mysterious ways, and his girlfriend, Maggie, a former recipe-writer turned horse trainer. There's the local mob boss, Joe Dale Bigg, who has his eyes on more than horses here. And, of course, there are the horses: Lord of Misrule, the Mahdi, Pelter, and Little Spinoza. The story moves between most of the colorful characters and even some of the horses and narrator Mary Lucretia Taylor does a wonderful job alternating voices. The National Book Award council got it right in naming this their award winner in 2010. For Camille and Caleb fang, the only worthwhile art is the product of chaos and havoc. Their children have learned that when it comes to the creation of art, nothing is off-limits. Annie and Buster (known in artistic circles as Child A and Child B), are used to playing vital (if sometimes unwitting) participants in their parents’ performance art. After a series of personal setbacks, both Annie and Buster come home to recover and regroup, and resist the urge to fall back into their parents’ artistic endeavors. When they receive a call from authorities informing them that their parents have disappeared and may be dead, Annie and Buster don’t know whether to begin mourning, or assume they are the unwilling participants in one more performance. Fans of the films of Wes Anderson (especially The Royal Tennenbaums) are sure to enjoy this quirky, mirthful tragedy. Alison Bechdel has been drawing comics for a long time now. It wasn't until the publication of her first graphic memoir, Fun Home, that she became hugely popular. While that one focused on her relationship with her father who was closeted, violent and eventually committed suicide, Are You My Mother? is about Bechdel's relationship with her mother. The subject matter isn't as dark and tragic, but this book is more intense and personal, delving into an exploration of the self. She seeks to make sense of her adult depression and anxiety by taking a look at patterns developed during her childhood.